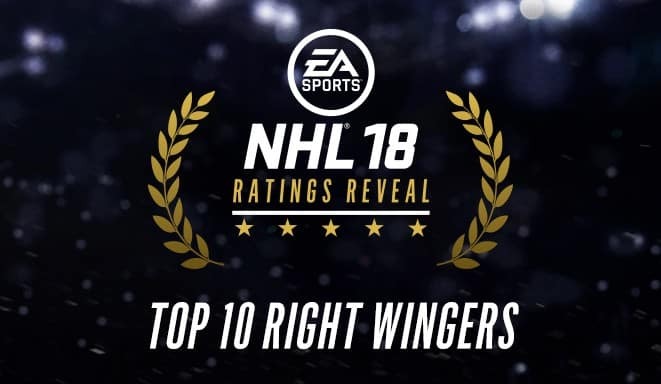 We continue the NHL 18 Player Ratings Reveal with the Top 10 Right Wingers courtesy of EA Sports. There are a few young guns gracing us with their presence and two teams you might not expect have 2 players each in the Top 10.
Who are they? Let’s find out. As soon as Kessel laces up the skates, he’s a serious offensive threat to any defense on an already star studded Penguins roster. He’ll start NHL 18 with 5-star rating in Puck Skills, Shooting and Skating and highlighted by his 93 speed, with 93 deke and 90+ in everybody shooting statistic makes him someone to be feared and on a team with Crosby and Malkin that’s high praise. The 19-year-old Laine stormed on to the scene last season recording 36 goals for the Winnipeg Jets with a shot to be feared and in NHL 18 he’ll get to show it off with his 5 Star Rating in Shooting. And his Slap Shot Accuracy (92) and Slap Shot Power (92) makes for one of the most dangerous one timer partners in the league. Wayne Simmonds is the perfect Jack of all trades master of none player, with his 4.5 star rating in Puck Skills, Shooting, Skating, Defense and Physical. He will never be a superstar, but he’s asked to do many things on the Philadelphia Flyers roster and he never disappoints. Probably the most talented offensive player on the Philadelphia Flyers, Jakub Voracek can lead a comeback in a hurry. His 5 Star Pick Skills and Shooting ratings gives him the freedom to be as creative as he wants in determining what to do with the pick. He can dish a nice one timer to Claude Giroux with his 91 passing or bury home a sweet Slapshot with his 90 Accuracy and 92 Power. One of the best young stars in the NHL, David Pastrnak wizardry with the puck is amazing at times. The Boston Bruins right wing has elite Puck Skills with 93 Deking, 92 Hand-Eye, 91 Passing and 92 Puck Control, meaning there isn’t a defender he can’t get by. Then when he does get past the defender, he can use his 5-star shot to bury the puck past the goalie. The 31-year-old Wheeler, despite getting up there in age, just recently posted another 70+ point season proving he’s still one of the better Power Forwards in the league. His combination of 4.5-star ratings in Puck Skills, Shooting, Skating and Physical (highlighted by 90 strength) provides him with a wide arsenal of ways to be effective on the ice. Joe Pavelski, the San Jose Sharks captain, despite being a winger is able to play a strong Center with his 85 Faceoff rating and Pavelski’s 5-star Puck Skills, deadly Shot Accuracy and Defense abilities make him excellent 2 way player regardless of what position he’s playing. For a while Steven Stamkos was the lone young Superstar in Tampa Bay, but as Stamkos battled injuries last season, Kucherov cemented his claim as another elite offensive playmaker for the Tampa Bay Lightning. Utilizing his 5 Star Skating, Shooting and Puck Skills to weave between defenders and generate offense the Lighting thought was gone once #91 hit the shelf. It was business as usual last season for the 25 year old Blues star to the tune of a 39 goal (75 point) season. Tarasenko’s an elite playmaker with the pick who uses his 94 Deke rating to weave his way through traffic on a nightly basis, accompanied by his 5-star Shooting, Skating and Senses from an offensive standpoint, there are few as gifted as him. The 10 year vet (despite only being 28) just keeps getting better and better. When it comes to dynamic offensive talents, there’s nobody like the 91 overall Kane. 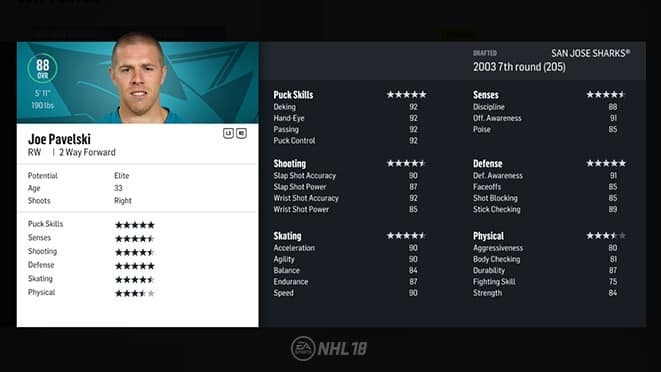 He has top notch Puck Skills, where his 97 Deke and Puck Control ratings leave defenders and goalies alike beaten regularly. His ability to generate offense at such a high rate is a key reason the Blackhawks have been one of the elite teams in the league since he was drafted.